It’s a proven fact that StorySpeakers earn more, out-perform, do better at school, work and home, get hired and promoted faster and get better service in person, and over the phone than fact-speakers. 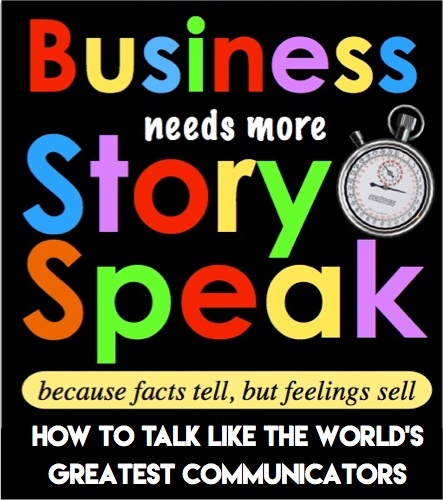 When Bill Gates asked Warren Buffett “How do you define success?” Buffett replied, “I tap dance to work.” In StorySpeak that’s what we call “Talking in Color” because it slips an image into the imagination with a few simple words and they conjure up a happy feeling in the body and a memorable image in the brain. Warren Buffett could have taken five minutes or ten paragraphs to factually explain how he defines success and how it makes him feel but instead he did it in five vivid, memorable words. He’s famous for talking this way. Mr. Buffett credits his ability to conjure up simple word pictures and short stories as a big part of his success. He knows the golden rule of StorySpeak: facts tell but stories sell. Steve Jobs was obsessed with i-Kolas. He made complicated abstract ideas into happy pictures. He conjured “graphical interface” into “desktop” and called the computer “a bicycle for the mind” and we all know what a “mouse” is. The names Apple, PayPal and Windows are all StorySpeak. Happy words. StorySpeak is calling men’s perfume “aftershave,” branding Albacore tuna as “Chicken of the Sea,” and telling the boxing world “I’m going to float like a butterfly and sting like a bee.” Happy stuff. Martin Luther King Jr’s “I have a Dream” speech is full of metaphors, similes and parallel experiences. When Queen Elizabeth 1 of England proclaimed “I have the body of a woman, but the heart and stomach of a king” she whipped her troops into a fervor and sent them roaring into battle more than five hundred years earlier. StorySpeak. Charismatic Communicators get other people to tell their stories for them. This is called giving your story “legs.” If your word-pictures and stories are simple, different and emotive and your followers like them they’ll run off and share them with others and do most of your work for you. When educators StorySpeak they keep their students engaged and interested by transforming learning into lively experiences. These teachers know that a great storyteller must first capture the student’s imagination and hold their attention and second, transport them into another world. And they know the way to keep those students in that other world is by continually increasing the tension in the story until the conclusion is reached, the lesson learned and the message delivered. This strategy doesn’t just apply to motivating school-children––it’s everywhere in society. When things get competitive it’s all about the story. Today’s corporate leaders like stories because they bring their company’s heritage to life in the imagination. They share their stories with their customers, their staff, their new hires. They live them. Corporate leaders StorySpeak their visions and goals. Successful entrepreneurs StorySpeak naturally. They use stories and word pictures to quickly get their ideas across in a tasty manner and make them stick. They talk about planting seeds, bearing fruit and cutting out the deadwood. In 1975, two screenwriters walked into a Hollywood producer’s office and planted three words, “jaws in space,” and the blockbuster movie Alien was born. Pure StorySpeak. Patients and doctors have long understood the power of telling and listening to personal accounts. Patients want to hear the stories of other patients who’ve gone through the same thing. Imagination is at the heart of one of the longest-running mysteries in western medicine: the placebo effect. This is the idea that pain or illness can be relieved through “fake” medicines like sugar pills, just because the patient believes he has received a real treatment. Researchers know the placebo effect is a perfect example of the power of the imagination to engage forces beyond a patients’ conscious control. More and more companies are catching on to the importance of storytelling. At Nike, several of their senior executives are called “corporate storytellers.” They explain the company’s history to everyone from vice presidents and sales reps to the hourly workers who run the cash registers at Nike’s stores. Weight Watchers couples solid data with real-world stories of people making better food choices to improve the health of their customers. John Deere shares solid data with real-world lifestyle stories of people interested in farming. Lego shares solid data with real-world stories about families bonding while building together. ‘The Magic of Heineken’ tells of the beer company’s founding in Amsterdam in 1864. Successful blogs use stories to hook the attention of their readers and transport them around the world in a million ways. TripAdvisor is filled with true stories from people enhancing their lives as a result of their services. TED’s mission statement is to spread understanding through stories. Facebook, Linked-in and hundreds of dating sites invite people to share their stories to fill gaps in their lives. Fundraisers weave real-world stories into their communication efforts to capture interest, elicit engagement and get the wheels turning. Online they use the StoryBook approach, alternating photos with short, ten second blocks of text. They found that turning the spotlight on their participants, staff and volunteers was not just a great way to show gratitude for their involvement, but also a great way to connect with the community at large. Research shows that Jurors construct stories inside their heads to provide meaning to situations they never experienced first hand. The problem with this is they use their personal emotions, values and beliefs to evaluate the credibility of defendants, witnesses and evidence. This may not benefit the lawyer or the client. A great trial attorney will beat them to it by planting his or her favorable take on the story so vividly in the decision-maker’s imaginations, they see that version as the truth. Stories are quick and they stick. Customers like hearing them because they quickly build trust and make relationships human and personal. Two weeks after the show people will remember you and your stories before they remember the booth or the facts and figures. Romance is the art of expressing sentimental love. “Romance” is also the French word for story. At its simplest, it is amorous gestures towards the one you love. At its best, it is deliberately creating wonderful memories that serve to form a foundation of specialness on which you build the loving relationship of your life. This comes from the stories you create together. Stories you tell yourself, each other, and to other people.